Fire and steel are powerful and alluring to me and draw me like a moth to a flame. The prehistoric, animalistic attraction of fire has always mesmerized me. I can set up a ring of stone, throw in some leftover wood or tree limbs, light it up, and watch it burn for hours. Memories of campfires, barbecues, and brush clearing with my dad and family run around in my head while I watch the flames lick the wood and hypnotically dance around. Steel, and to a greater extent other forms of metal such as aluminum, have also grabbed my attention for many years. I have never been adept at building anything with wood. If I tried to make a table one leg would be uneven. If I tried to level it by trimming the others I would probably have to keep going until the table legs were nothing but nubs. I’ve just never had any skill at woodworking. Wood to me is not a building material but a fuel. I’ve had more success while working with steel. I’ve fabricated parts and crafted projects around the house out of steel. I purchased a Mig welder years ago while working at a motorcycle salvage yard and enjoy tinkering with it. My brother and nephew are welders by trade but I lack the knowledge or even sense to learn how to weld at a higher level than craptastic. However, I can most often make the two pieces of metal stick together well enough to consider my work passable to myself. I love heading out to the garage with some project in my head. After cutting and grinding steel pieces the welding begins. The Mig welder emits a buzzing sound and sparks fly as two independent pieces of metal become one. The welding joint glows hot red when the edges are fused together. The silence after the welding operation is broken by a hissing sound when water is poured onto the now solid connection. More grinding follows and sometimes drilling and/or tapping or threads occurs before the mechanical job is complete. When finished, I’ve resolved a problem, fulfilled a function, or built a device. Wood fired BBQ smokers have a similar attraction to me. First it’s the wood; once a living thing and chosen specifically by type be it pecan, hickory, mesquite, one the varieties of oak, or other. 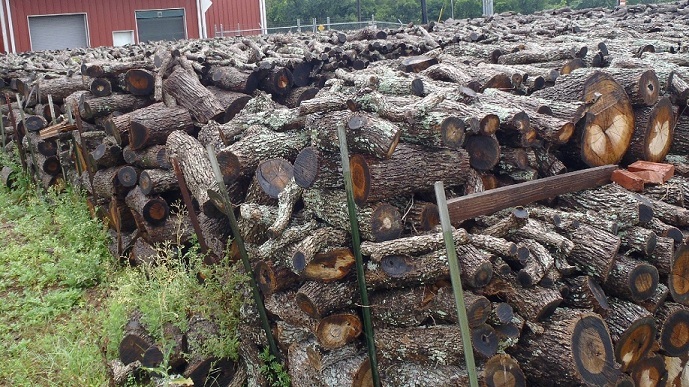 The wood is then seasoned and stacked so as to be ready to be converted to energy by fire. When needed, the sticks of wood get tossed onto the fire and the smoke drawn from that wood then imparts its specific seasoning directly into the meat. The wood is one of the beauties of honest Texas BBQ. In this instance I am talking only indirect wood smoked BBQ. Direct cooking is done by some BBQ joints by burning wood down to hot coals in a dedicated pit and then the coals are placed directly under the meat. Indirect cooking involves the wood fire occurring in a section set off to the side of the main cooking area and the heat and smoke being drafted into and through the cooking area. The offset is usually called a fire box but some locations employ pits with the fire exposed on the floor beside the cooking area; hardly a box. The operation is not set-and-forget. Attention has to be placed to the fire in order to keep the temperature in check. It seems simple enough but too much or too little wood over the many hours that a brisket requires can ruin it or even take a brisket from great down to just mediocre. Adjusting the fire is like adjusting the throttle on a motorcycle; too much and you can ruin your day. Different varieties of work each add their own different properties to the meat. Mesquite is the strongest and adds a hint of acidity or bite to the flavor. Pecan is at the opposite end and gives a sweeter taste. Hickory is a mellow actor and oak imparts, well, a strong “oaky” flavor and is my favorite of all for brisket and beef ribs. The path of moving from a living tree and conversion to both fuel and seasoning adds a complex element to honest Texas BBQ that thermostat controlled gas ovens just cannot compare. I have a hard time calling a large gas cooker a “pit”. Many commercial smokers are made from steel. Custom pits like the Klose-built one behind Louie Mueller and converted propane tanks like those at Franklin BBQ have a human element in common. Welders crafted and customized the pits to specifications. The best pits have even been fine-tuned to provide consistent temperature across the cooking area. The steel itself of course comes from the act of fire. Iron and other elements are melted at high temperatures and forged into metal. Born from fire and yet put to work containing a lower temperature of the same for years and years of service. Even the rectangular brick exterior smokers famous in Lockhart have lids fashioned from steel. The bricks themselves were transformed from clay to brick by fire. There is no cooked food that is closer to the earth than wood smoked BBQ from a pit. Motorcycles have also held a warm place in my heart for years. Old school mini bikes and Cushman scooters were my first experience on motorized machinery and motorcycling has been part of my life ever since. Dad collected Cushman motorcycles and I vividly remember the glass float bowls that were used. You could see the gasoline swirling around prior to being fed into the carburetors. What a wondrous device, motorcycles. From the operator they require balance and use of both hands and both feet. When encountering a turn one physically leans while counter-steering with the arms. Arriving at a turn the rider may roll off the throttle with the right hand or brake with the fingers of the right hand. In a nice tighter turn the left hand pulls in the clutch. Next the left foot shifts the transmission down one or more gears. Before, during, or even after this occurs the right hand may apply additional braking force. If the speed differential required is great then the right foot is also employed to reduce speed. The right hand then controls the throttle through the turn, increasing and accelerating as the turn fades into a straightaway and the rider begins to regain a vertical position. 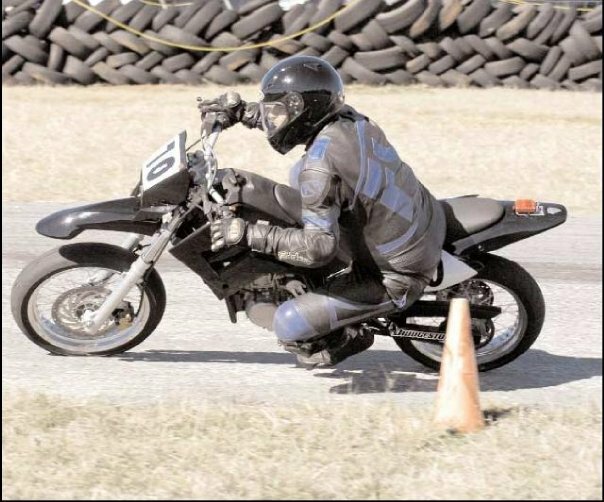 On a sports bike the amount of lean can be great enough to touch the knee to the pavement. With plastic pucks to protect the body scraping the asphalt the feel of the road is transferred directly to the rider’s body. The sound of the plastic scratching away provides an audible memory of that event. At the outset of the turn the left side of the body comes back into play as the clutch is pulled again and the left foot makes another shift while the right hand adjust the throttle between shifts. The experience of riding a motorcycle is that you become part of the motorcycle. You work as a unit with metal and fire to move from one location to another. I’ll get to fire in a moment but there is even more to the experience of riding a motorcycle I would like to explain. Because you have no roof, no air conditioning, no filter of the outside world except a helmet and riding gear, a motorcycle rider also gains an innate connection with the environment they travel through. On a mid-temperature day one feels the coolness as a road dips even slightly in a valley or passes through a tree covered section of road. The smell of piney woods, hay, and smoke are inhaled through the nostrils. A rider’s ears are filled with the aural melodies of the engine. Most cars are designed to isolate the driver from these experiences. With the exception of pure sports cars, the vehicle’s cabins are deadened with sound barriers. The driver is strapped into place by a seat belt. Many steering wheels lack the sensitivity to truly feel the changes as the road passes underneath. Seats cushion the body as it resides in a position akin to a couch and there is no requirement to lean in order to navigate a turn. There is no need to balance; when coming to a stop the door isn’t opened and a foot placed else the car falls onto its side. A rolled down window or even a convertible top is no substitute for the experience of riding a motorcycle through the countryside. Modern cars are designed to insulate the driver from the environment. DVD players, quality sound systems, dark tinted windows, air filters, and modern suspension systems further remove passengers from any visceral enjoyment of the true automotive experience. How can one enjoy the changing landscape and sights of a road trip when their focus is not on the exterior, but rather on an animated film or slapstick comedy? For children today, a road trip is more like akin to sitting in a movie theater rather than actually traveling across countryside. While I write of joyous riding conditions for motorcyclists, it is the opposite end of the spectrum that also defines motorcycle riding. Temperatures over the century mark make proper hydration critical and wear on your physical strength. Freezing temperatures can numb the hands and feet. Rain is just downright messy and even with waterproof garments there is no complete respite from the water. Cleaning the bike after a long ride through the rain is a messy affair. Those wonderful smells are sometimes interrupted by the smell of a trash fire or the pungent fumes of a rotting animal corpse. Luckily the latter is usually only occurs for a brief moment. It’s harder to explain how this exposure to the negative elements also adds to the experience. After riding through a rain storm there is relief, and the smell just before the rain falls can be enjoyable as well. The feeling of stepping into a cool hotel room at the end of a day’s ride on a motorcycle cannot compare to the same after hours in a car or truck. Because you are in the elements you also become more aware of them. More attention is placed on weather and it can even become necessary to alter a long distance route in mid-ride due to changes in weather. While in the moment of the ride I may not enjoy any of the poor weather conditions I do feel a sense of accomplished after conquering them. At this point you should have made the obvious connection of metal to the motorcycle. Built from steel, or aluminum as is more common, the frame was forged from fire. The wheels that hold the tires, the forks and suspension, and other parts are metal as well. The engine itself is a block of metal bolted together with cylinders carved into it. A motorcycle is mostly metal, propelled by fire. The source of fuel for all but a tiny fraction of motorcycles is gasoline. There are electric motorcycles but the number is negligible today. Gasoline of course is derived from oil, which itself is a byproduct of a living thing that has decomposed over thousands of years. Both the gasoline used for an internal combustion engine and the wood used to smoke BBQ serve the same purpose; energy and heat. The fuel for the engine is passed into either a carburetor, or more commonly today, a fuel injector. An electronic pulse is sent to the injector and it opens mechanically for a brief moment, spraying a precisely metered amount of fuel into a chamber where it is mixed with air. On a carburetor based system the fuel is drawn into the chamber by an air vacuum and the mechanics of this are amazing to me; when tuned well it is a perfect synchronization of the elements, balanced and flowing as the air and fuel mix harmoniously before entering the combustion chamber. Unbalanced however, a carburetor can be a beast to deal with and inconsistent metering of the air/fuel ratio makes for at best a frustrating experience. Fuel injection is more common as it is more accurate; resulting in improved fuel economy and lowered emissions however it lacks the mechanical wonders of a carburetor based system. Once in the combustion chamber the air-fuel mixture is compressed and then ignited by a spark. The resulting controlled explosion pushes a piston away and the process of filling and compressing begins again. On a two cylinder vehicle each push from the explosion assists another cylinder through its exhaust phase. On my BMW these two cylinders lie horizontal and move left and right. The design is called a “boxer” and the slightly horizontally spaced pistons swing back and forth like a boxer clasping his gloved hands before a fight. Unlike a human boxer though each piston trades duties equally; there is no weak side. Repeating thousands of times a minute the dance continues. On the highway this can occur 3,000 times or more a minute per cylinder for a total of 360,000 times per hour. In a single day it’s easy for this controlled fire to light and extinguish well over a million times in near perfect synchronicity even on a two cylinder based machine. Higher revving and multi cylinder machines increase this ratio, but balance is the name of the game. That is except for some engine designs such as Harley Davidson. They use an unbalanced system, which gives them a ride with vibrations and that “potato-potato” sound. Say it out loud a few times in a row. Harley Davidson even tried to trademark the sound but eventually gave up the fight. Ironically in the 1980′s the Japanese motorcycle manufacturers tried to enter the territory of the Harley V-Twin. Their engineers didn’t understand the intentional imbalance though, and removed it as they “perfected” the design. Motorcycles such as the Yamaha Virago and Honda Shadow employed overhead cams, improving power and reliability but removing some of the “character” from the Harley pushrod design. They also used shaft drive rather than chain. There are a number of advantages with a shaft drive such as lowered maintenance and elimination of chain lube that can fling off and about the bike but they just weren’t able to draw away the faithful. They probably would have and Harley would have gone bankrupt If not for the Evo engine which was introduced in 1984 by Harley. This aluminum head and cylinder design was oil tight and reliable, replacing the Shovelhead engine which hadn’t changed much since 1966. Meanwhile the Japanese experimented with V-4 cruisers (the Honda Magna and Suzuki Madura) and even inline 4 cruisers like the Suzuki GS650L, of which i still own. none of these bikes had the feeling or sound of Harley and these unconventional machines eventually gave way to essential Harley clones, where the engineers in Japan induced imbalanced back into the design. However, on all of these machines the pistons drive a crankshaft that in turn powers the rear wheel via chain, belt, or shaft. The energy of the fuel is converted via the fire and transferred into motion. A metal framework holds it all together. The fire is driven by fuel within a metal machine and exposed to the elements of weather. The same thing occurs in an outdoor wood fueled steel pit as the wood gives itself to fire and smoke in order to slowly transform a tough piece of brisket into an enjoyable feast.